Get your slow cooker on, and reach for the coffee syrup! 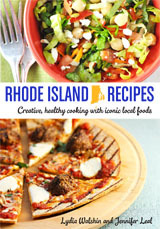 Rhode Island Recipes came out two months ago, but we haven't stopped cooking with our favorite iconic local foods. I use my slow cookers a lot in the summer, to keep the kitchen cool. This slow cooker sweet coffee flank steak nachos recipe, which I shared on The Perfect Pantry, uses Dave's All-Natural Decaf Coffee Syrup to add depth of flavor, and a bit of sweetness, to slow-cooked shredded beef. It makes a great topping for nachos, or use the meat as filling for quesadillas, panini, or pita bread. Get the recipe for slow cooker sweet coffee flank steak nachos here.